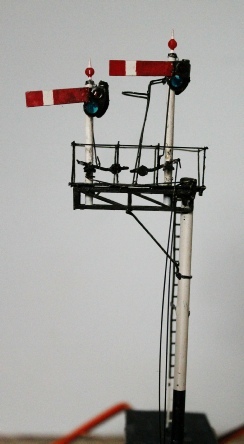 4mm Scale GWR lower quadrant tubular bracket signal. Features working lamps - warm white smd leds (not switched on for photo) servo motors fitted. Support post cap is from brass rod turned on lathe. Apart from the working lights this signal is similar to those built for a new layout base on Bewdley in the mid 1960’s, which should be appearing on the exhibition circuit soon. Of course being WR of that era their posts are painted aluminium rather than white. (Strangely enough, photographic evidence suggests that the gallows starter signal there always had a white post and was never repainted in aluminium.